Exceptionally Portable, Wireless, Noise-Cancelling, Luxury Traveler’s Headset. Today’s busy executive has more things to do while they travel than ever before. Denon’s line of Globe Cruiser Headphones create peace and order in the midst of noise and chaos. Slip on a pair of Denon Globe Cruiser headphones and escape the environment around you so you can better focus on what you need to do. Whether it’s just relaxing and enjoying your favorite music, conducting a conference call, asking Siri® to check your departure gate, or using the voice recognition capability to dictate an email on your iPhone® 4S to your boss about closing that business deal, Denon’s line of Globe Cruiser travel headphones provide exceptional sound quality and styling. Denon knows sound. As a company that’s been in the business of sound for over 100 years, you could say we’re more than a bit obsessed with good quality sound. We know great-sounding music can be the best remedy for even the most hectic day of travel, and all Denon Globe Cruiser Headphones have been professionally tuned to provide the purest acoustics no matter what genre of music you listen to. Put a pair of Globe Cruiser headphones on, crank up your favorite song and you’ll feel like you’re in the center of your favorite band or sitting next to your favorite artist. Globe Cruiser AH-NCW500BK On-Ear headphones have an integrated amplifier to provide superior performance and feature a 10 hour rechargeable battery. When the battery runs out, connect the detachable audio cable (included) to continue your audio enjoyment or simply re-charge the battery. When you’re trying to concentrate on a plane or train, sometimes the most annoying thing is the drone of the plane engine or the train on the tracks that keeps you from concentrating. The AH-NCW500BK headphones feature subtle active noise cancellation circuitry to actively block out external noise while allowing you to hear emergency announcements or converse with other passengers. Tired of your traditional wired travel headphones restricting your movement? 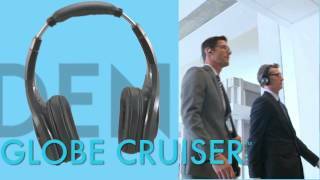 Denon’s Globe Cruiser line of Headphones include wireless Bluetooth® 3.0 connectivity models, so you can navigate thru busy terminals, train stations, or anywhere you need to go without getting yourself or your luggage tangled up in cable. Better yet, Denon Globe Cruiser Headphones include both aptX and AAC decoding to provide CD quality audio over the Bluetooth wireless connection, making them the perfect earphones for travel. Your enjoyment of music doesn’t have to stop when you board the plane and the flight attendant tells you to turn off all wireless devices. The Denon Globe Cruiser AH-NCW500BK On-Ear headphones feature a detachable audio cable connection, located under the right ear cup, and ship with an audio cable for when wireless listening is not allowed. To make wireless audio even more convenient, we’ve incorporated wireless control of your smart phone with the very intuitive Denon control wheel, which mimics the operation of a conventional rotary control. To turn the volume up, simply rotate the Right control wheel gently towards the front of your face. Volume down? Rotate the Right control wheel to the rear. Press the center of the right control wheel to play / pause the music, and the center of the left control wheel when you answer a telephone call. The Globe Cruiser On-Ear Headphones also feature microphones for talk right in the ear cup. No need to fumble with your smartphone while cruising the airport. We know a great pair of travel headphones is much more about sound and function. It’s also about fit. In a quest to provide the most comfortable, best fitting travel headphones, Denon’s engineers have studied over 4,000 pairs of ears from people around the world, to come up with a design that automatically accounts for the subtle differences in ear shape, placement, ear canal size, head size and jaw depression. We know that fit and comfort comes from paying attention to the small details. Denon’s patent-pending Pentagonally-shaped memory foam ear pads provide the ultimate in comfort for long trips, while our 2-axis ear cup design, adjustable headband and over the ear headphone provide for a perfect, custom fit. Better yet, Denon Globe Cruiser models are exceptionally portable so you can pack light. The AH-NCW500BK is engineered to fold flat into its protein leather carrying case (which is about the size of an iPad™). The case also features a detachable Karabiner so you can opt to hook the case onto your briefcase or purse instead of taking up valuable space inside your bag. Other accessories included are detachable audio cable (for those times when wireless listening is not allowed), USB micro charging cable (for charging the battery), and airline adapter. Enhance your travel experience with the Denon Travel smartphone application, available on iOS or Android® platforms for phone headphones. This travel application allows you to create custom playlists on the fly; create, store, and share custom EQ curves; enjoy over 70,000 internet radio stations worldwide via TuneIn® Internet Radio; automatically update your Facebook/twitter status; and aggregate all of your common travel applications for easy access so you don’t have to spend your time scrolling thru pages of applications to find them.